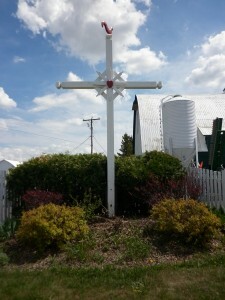 In general terms, most of Quebec’s wayside crosses were constructed to mark or commemorate an event, as a gathering place for families in a rang, to fulfill a vow or to secure future protection. (A rang, literally “a row,” is a rural grouping of houses strung out in a line, usually a few kilometers long, based on the seigneurial system.) The details can be hard to come by. 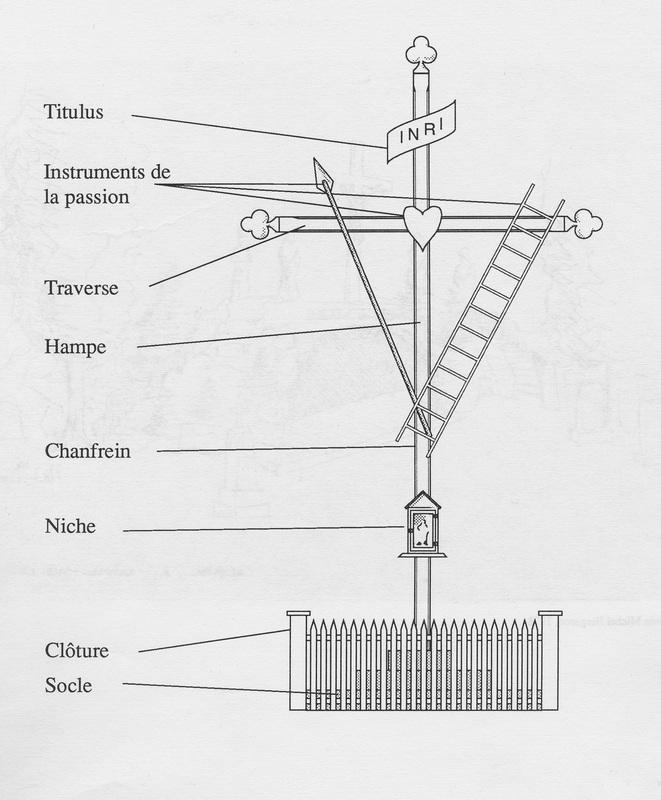 In the 1970s, a survey of over 2,500 crosses found that in at least 62% of cases no one knew why a cross had been erected, though it was quite recent, usually within a generation. In many other cases, the reason was vague (“a vow, I think”) with no defining details. Jean-Marc’s response, in other words, is typical. While the object is carefully maintained and recreated, the stories that cling to it, the original prayer-stories that impelled its construction, are often lost. This is counterintuitive, given much of the research on meaningful domestic objects. The “life of things” approach, which traces the biography of an object as its social meanings shift and change, has been especially useful in showing how mementos and keepsakes gain value as they are passed down. Likewise, caretakers view wayside crosses as valuable because they are inherited, the material traces that remains after their builders have passed away. 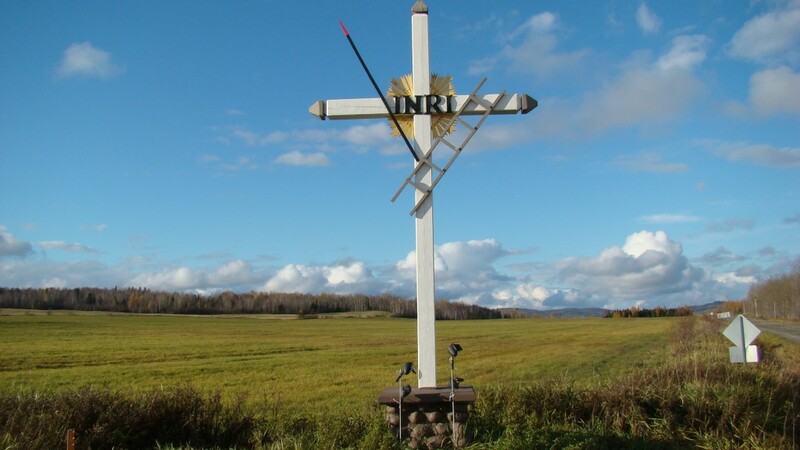 Especially in rural areas, the Quebecois sense of self has traditionally been tied to kin, Catholic piety, and the land; each aspect is united in the cross, which is handmade by local Catholic people and rooted in the ground. Whereas a prayer cloth may link members of a community through its circulation, the wayside cross does so because it stays put. 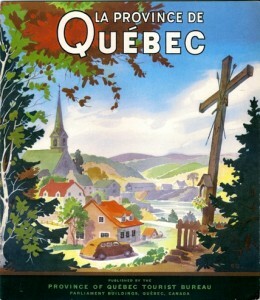 It is a material manifestation of commitment, of remaining in the Church and on the family’s land despite the rapid secularization and urbanization of Quebec since the 1960s. Most caretakers prize material coherence, though (unlike most domestic mementos) wayside crosses are outdoor objects and must therefore be replaced after the ravages of successive winters. Caretakers erect new crosses on the sites of the old ones. Family members are especially likely to recreate the original decorations or aspects of them. Photos, souvenirs, antiques, or personal mementos are meaningful because they materialize particular stories associated with particular ancestors. Their sentimental value is lost if their stories fade such that no one can remember why they were purchased or kept. Of course, scholars recognize that, as cultural theorist Annette Kuhn writes, “A family without secrets is rare indeed.” Domestic secrets may affect the objects we pass downa photo with an ex-wife excised, for exampleand they often have the whiff of the illicit. They are the objects and stories, writes Kuhn, that families keep hidden from the world: things lied about, willfully forgotten or never mentioned. Wayside crosses sometimes conceal such secretsa vow associated with alcoholism, for example, or with infertility. Most of the time, though, caretakers insist that it was nothing so dramatic; the story was simply lost or never told. This response is counterintuitive for another reason: an object’s concrete form structures people’s relationships with it (and scholars’ questions and conclusions in regard to it). Standing at the base of a wayside cross, it is difficult to imagine how its prayer-story could be deemed unimportant, or have been lost or concealed. Wayside crosses are, after all, objects abundantly revealed. They tower 15 feet or so. They are lavishly decorated and even illuminated by electric lights. They are painted bright white and flanked by colorful flower gardens. If a road is rerouted or a new building obscures it, some caretakers hire construction equipment to move the cross to a more prominent location. “Well, of course, it’s not a croix de chemin if you can’t see it!” I am often told. 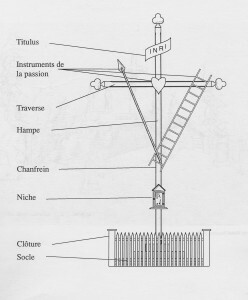 The crosses must be visible because their primary purpose is to stimulate a pensée (a short thought) about God. Caretakers distinguish between prayers,which they define as longer and more formal, like the Hail Mary or Our Father, and pensées. Such thoughts are deep but fleeting. They can flood the mind unbidden and, according to caretakers, may affect even the most irreligious passersby. For caretakers, this relationship between God, object and passerby is construed as proof that Quebeckers, who have the lowest rate of church attendance in North America, are nevertheless still believers, though they may lack religious education or feel overwhelmed by the busyness and materialism of modern life. Through the wayside cross, God infuses them for a moment with what they need but have forgotten. But revealing/concealing has another layer. Crosses are rendered invisible, caretakers say, when irreligious people cannot (or refuse to) see them, mistaking crosses for telephone poles, perhaps, or TV antennas, or car accident memorials. Other times, crosses simply blend into the landscape. I was skeptical at first: how can a 20-foot cross, with a golden corpus of Jesus no less, remain unseen? Yet it’s true. Though caretakers expend significant effort beautifying their crosses so as to counter this stubborn invisibility, it is easy to miss a wayside cross if you aren’t looking for it and sometimes even if you are. Most people never notice the crosses planted along roads they travel every day. Returning to my question and to Jean-Marc’s response brings us to the question of meaning. Anthropologists (including me), and Christians (including Quebec Catholics), share a strong belief in meaningfulness: ordering events, things, and ideas in ways that make them intelligible. Jean-Marc and I agree that the crosses are meaningful. Where we differ is in our understanding of intent. Whereas I view the prayer-stories that led to its construction (the original intent) as indispensable to the cross’ contemporary meaning, for Jean-Marc these are dissociable. Knowing that the intent was grounded in Catholic piety is enough. Perhaps the best way to think about the crosses’ meaning is two-fold. First, as per David Morgan, people don’t translate every sensation into discourse. The difficulty, as Morgan notes, is that scholars still rely on people to verbalize their feelings so that we can translate them into academic writing. Though eschewing words altogether is therefore (at this point anyway) impossible, Morgan urges us to nevertheless think differently about the moments when language fails. Rather than a lost scholarly opportunity, such moments allow other forms of meaning-making come to the fore, including the intuited and the sensory. Put in these terms, when caretakers rebuff my attempts to trace the narrative behind a cross’ construction, they may signal that the real story relates to how the object mediates tangible presencethen and now. This brings us back to secrets. Anthropologist of African religion Tom Beidelmann synthesizes the work on this topic, concluding that secrets are powerful in part because they intimate the existence of an unknown and unknowable world, one where a man or a woman speaks to God. And the fact that the contents of a prayer conversation are private reiterates the existence of these two beings locked in discussion. This idea fits well with what Robert Orsi and others note about religious objects: they represent and constitute relationships between people and things, and between humans and God. It thus becomes less important (even irrelevant) to caretakers whether the cross was erected to fulfill a vow, to sacralise the land, or to ward off future calamities. That the original prayer remains secret only intensifies the fact of relationship between the pious ancestor and God. More importantly, the cross compels relationships in the present: between the caretaker and the object that physically binds him to the land and to Quebecois patrimoine (heritage); between the believer, the cross, and the deity who is mediated through it. Most complicated, perhaps, is caretakers’ belief that the abundantly visible cross may even compel a relationship—a pensée—between the irreligious passerby and God. Here we tread into the messy politics of laïcité (secularity), which seek to conceal signs of faith that seem to encroach upon others in unanticipated and uncomfortable ways. As debate rages around Quebec’s new “Secularism Charter” its effect on the crosses remains to be seen.